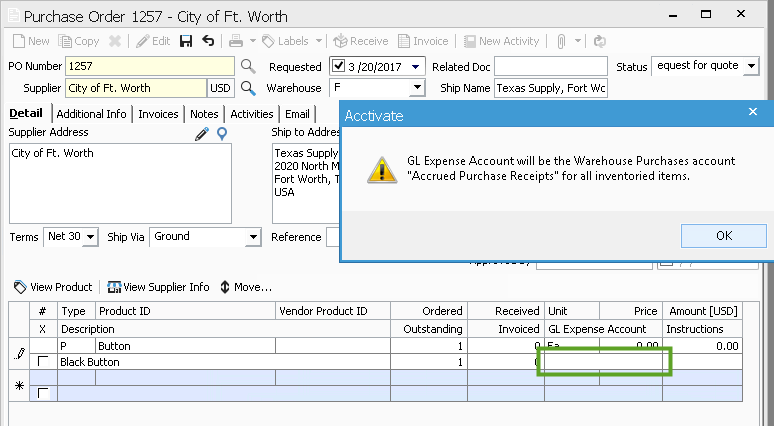 On the Purchase Order window, when entering products, users may notice the GL Expense Account field and believe a GL Account needs to be selected. For inventoried products, Acctivate will always use the Warehouse Purchases account, which is selected on the warehouse configuration window in Configuration Manager. GL Expense Account will be the Warehouse Purchases account “Accrued Purchase Receipts” for all inventoried items. This field will remain blank on the detail row for inventoried products. However, if you do add non-inventoried products to a Purchase Order, you will have the option to select a GL Account to expense the line to. For more information on where you can find the Warehouse Purchases account, click here.